It’s hard to believe a little more than a decade has passed since the iPhone was hitting our soon-to-be-mind-blown worlds. Twitter and a kind of college social network called Facebook were beginning to infiltrate our vocabulary. And a selfie? What was that? Today, it’s hard to remember a world without these. Just last year, we took 1.5 trillion selfies, posted about 6,000 tweets every second, and watched almost five billion YouTube videos. Across the medical landscape, technology like video chat and real-time virtual visits are taking hold at a furious pace. That includes physical therapy, where clinics are challenged to evolve with consumer demands. Traditional PT clinics are now competing with companies that offer online-only, virtual appointments with their own group of physical therapists. So, how can PT clinics take advantage of today’s technology to be most competitive moving forward right now? These technologies tap into consumers’ deep desire for human, personal, immediate connections that can transform the patient/clinician relationship and create greater profitability for clinics. But where will those profits come from? Even as I write this, the momentum of telehealth is bulldozing its way through dated reimbursement policies. Over the past two months, the Centers for Medicare and Medicaid Services (CMS) has begun shifting its policies in favor of telemedicine and telehealth services. In November, their newly released Fee Schedule includes changes that provide for reimbursement for expanding access to telehealth services. PT is not far behind. Sean Hagey, a physical therapist assistant and In Hand Health advisor, believes PTs can use four different CPT codes that all fall under “Remote Physiologic Monitoring” (codes 99453, 99454, 99091 and 99457). More details will be available after the release of CMS guidance in the near future. The desire for efficiency and human connection are the driving forces for In Hand Health’s newest offering: Virtual Visits. Virtual Visits are the easy, powerful way for physical therapists and patients to connect live video and audio on their smartphone or tablet. It’s fully integrated with the robust In Hand Health software suite that offers telehealth, continuing care and marketing solutions. With the combined power of In Hand Health’s custom-branded marketing tools and Virtual Visits, your clinic can create a personal connection with potential patients before they ever set foot in your clinic. 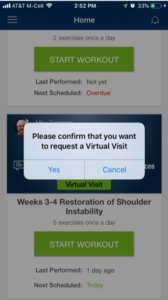 Use Virtual Visits to answer questions and build rapport with interested individuals who may not fully understand PTs relevance or benefits to them. The Virtual Visits hybrid model of in-person + telehealth combines personal interaction with customizable exercise videos—a model that keeps patients engaged throughout their treatment process. That’s a big deal, especially because about 20 percent of PT patients drop out of treatment within the first three visits, and 70 percent fail to complete their full course of care. Virtual Visits can be a powerful, personal and profitable connection as part of In Hand Health’sContinuing Care program. This optional eCommerce service enables your PT practice to provide its services to patients on a subscription basis. The personal, live experience not only helps reinforce the power of personal interaction, the subscription model can build your revenue right now. So, as reimbursement policies open new revenue streams, your clinic, PTs and patients will already be experienced at working remotely. 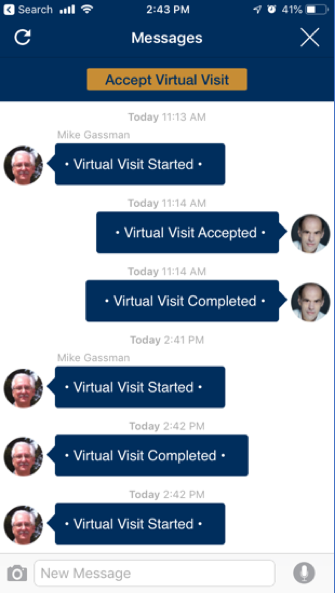 Virtual Visits: How do they work? Phillip twists his ankle and wants to reach out to his PT first for help on his In Hand Health app, then requests a virtual visit with his PT. 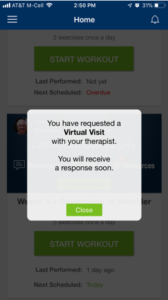 The PT (or clinic) receives a notification that Phillip wants to have a virtual visit. 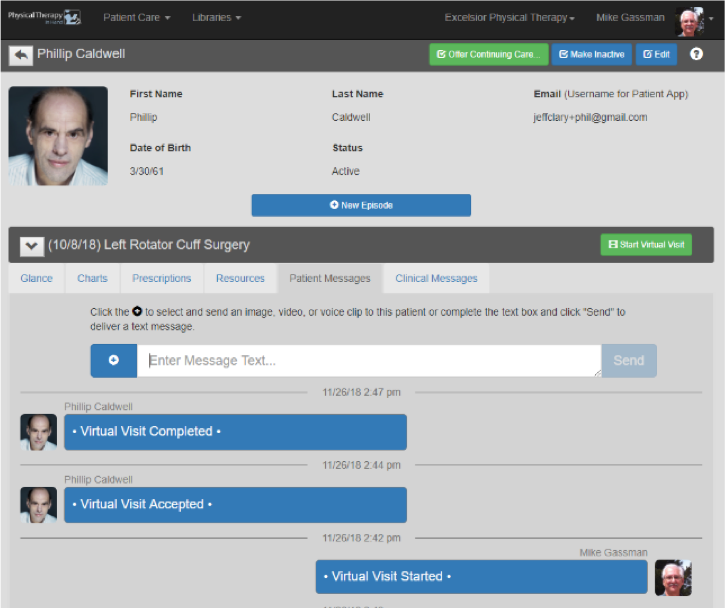 The PT can respond with an automated message, or he can begin the virtual visit immediately. 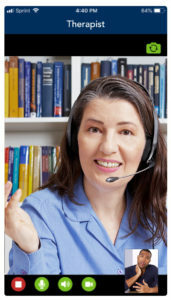 The HIPAA-compliant connection is established, and the live Virtual Visit begins. 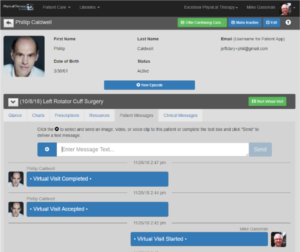 The PT can send the patient exercises or resources that can help him after the virtual visit concludes. When the session ends, Virtual Visits keeps a record of what happened throughout the call. Telemedicine is one the biggest drivers transforming the U.S. health care system, but PT clinics must understand how to prioritize innovation and integrate it into their practice now to achieve greater success. 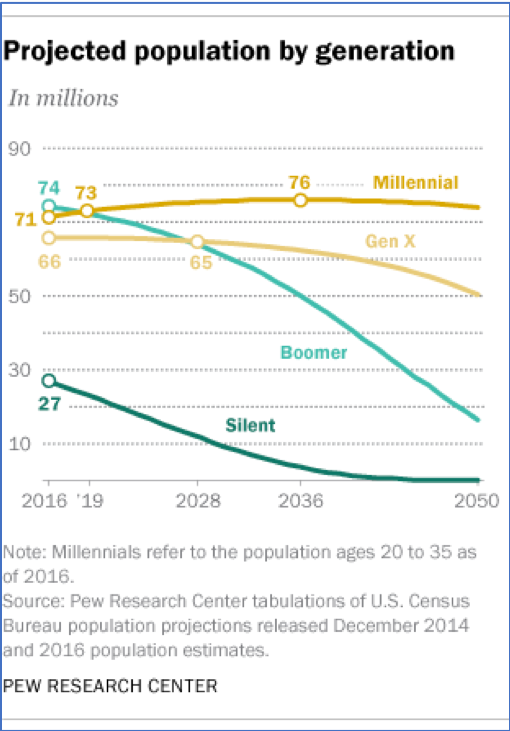 As of 2019, the 75 million Millennials in U.S. are now part of the largest living generation in the U.S. 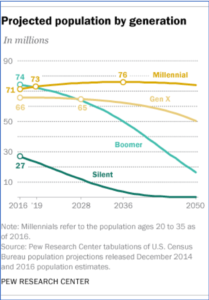 This group prioritizes telehealth above other generations—and they’re not afraid to shop around and research their health care options. In Hand Health’s new Virtual Visits offering is one more way PT clinics can take advantage of these changes to grow their practice—not just in the future, but right now. Michael Gassman is the founder of In Hand Health, an app-based software solution helping PT clinics thrive on three things: creating a dynamic patient experience; strengthening the relationships between PTs and patients; and increasing profitability. Share your thoughts about how PT clinics can develop a personalized experience on Facebook and Twitter.